We all like to customize our devices, whether just for aesthetics or to obtain a better performance. Zooper Widget offers endless possible configurations for our Android devices, with great detail in all its features. With this app you can change the color and type of font, size and position of the widget on the screen, add memory and battery stats, show the weather information, choose a calendar and a clock, etc. Once installed, we can download many different skins. They come in all styles, with different prices, many of them for free. Zooper Widget has a free version and a paid one (for $1.99). The Pro version offers some interesting features like the ability to save skins in the SD Card and remove the ads. We can download skins made by other developers or make our own, but Zooper Widget includes a few even with the free version. It also includes several text fonts, although if we are convinced, there is always the possibility of adding some additional ones. The calendar also offers a high degree of customization, and enables dates’calculation. That gives us the ability to define countdowns from any day of the year. The clock can be set at multiple time zones, all in the same widget. The battery options ranges from the information about the remaining time, until the temperature and voltage. The time settings can also be defined for multiple zones, and we can see the weather forecast for next 5 days, choosing among several weather services. 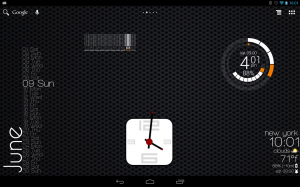 In summary, Zooper Widget is a great app to personalize our smartphones and tablets. Not only has a free full version very complete but also a lot of skins created by other developers, so we can probably find a style that we like!